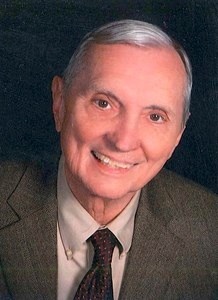 Dr. Bryce Joseph Jones, PhD, age 89, of Olathe, KS died peacefully Saturday, July 9, 2016, at Brookdale Senior Living. Bryce was born April 30, 1927, in Moberly, MO, the third child of John “Jack” & Mary (McElfresh) Jones. Bryce served in the US Army in the European theater at the end of World War II. He married Eileen Schaecher in 1948. The following year they had their first child, Bryce II. In 1955, he received a PhD in economics from St. Louis University, where he had also taught Economics as a graduate student since 1951. From 1955 to 1964, he taught economics at St. Joseph’s College in Rensselaer, IN, where he was appointed Chair of the Department of Economics and awarded the College’s first Excellence in Teaching Award and the 1963 Man of the Year Award. In 1961 their desire for more children was fulfilled by the addition of twins, Karl and Claire. In 1964, they moved to the Kansas City area, where Dr. Jones taught economics and chaired the Economics Department at Rockhurst College, now Rockhurst University. He was known for being a demanding but fair professor, who started each class with a prayer. He stressed the importance of social justice in his classes, in his professional duties and in his personal life. Among his recognitions were the Harry B. Keis Award for exemplary membership in the college community, the Alpha Sigma Nu Distinguished Teaching Award, the Sullivan Award for significant contributions to the mission of Catholic Charities, and the Pro Meritis Award for distinguished service to the community. Bryce was a devout Catholic, who would quickly and modestly express gratitude to the Creator for his successes. Although he was not preachy concerning his faith, his devotion was lived and reflected in everything he did, from his dedication to his students to volunteer work and from vacations exploring European cathedrals to his quest for the perfect martini. He retired from Rockhurst in 1992. He served on the board of Catholic Charities and volunteered in prison ministry. Following the death of Eileen in 2001, Bryce met Sharon Ward through their volunteer work at Villa St. Frances Nursing Home. They married in 2007, but through most of their married life, they endured together the heartbreaking challenges of his having Alzeheimer’s. Despite the challenges together they were active in promoting Alzheimer’s awareness and assisting Catholic Charities through volunteer work until he moved to Brookdale Senior Living at the beginning of 2016. Bryce was preceded in death by Eileen (Schaecher) Jones, his parents and two siblings, Marshall Jones and Carlin Brennan. He is survived by his devoted and attentive wife, Sharon; his children, Bryce II (Joan), Karl (Deborah) and Claire Stevenson (Randall); his grandchildren, Carolyn Otten (Liam), Gregory (Katie), Bryce III (Amber) and Erin Baxter (Sean); and five great-grandchildren. The family would like to extend their sincere thanks to the Staff of Village Shalom, where Bryce attended The Great Day Social Club for 20 months before taking residence at Brookdale College Square, where their staff also treated him with care and dignity. A special thanks to the Nursing Staff of Catholic Community Hospice who attended and aided Bryce in his final hours before going to Heaven. Visitation will begin at 9 A.M. and Mass of Christian Burial at 10:30 A.M. on Thursday, July 14, 2016, at Prince of Peace Catholic Church, 16000 W 143rd St, Olathe, KS. The Rite of Committal with Final Commendation will follow the funeral at Resurrection Cemetery in Lenexa, KS. In lieu of flowers, the family asks that donations in honor of Dr. Jones be made to the Alzheimer’s Association, Heart of America Chapter, 3846 W. 75th St., Prairie Village, KS 66208.